William Evans Hoyle, M.A., D.Sc., M.R.C.S., F.R.S.E. 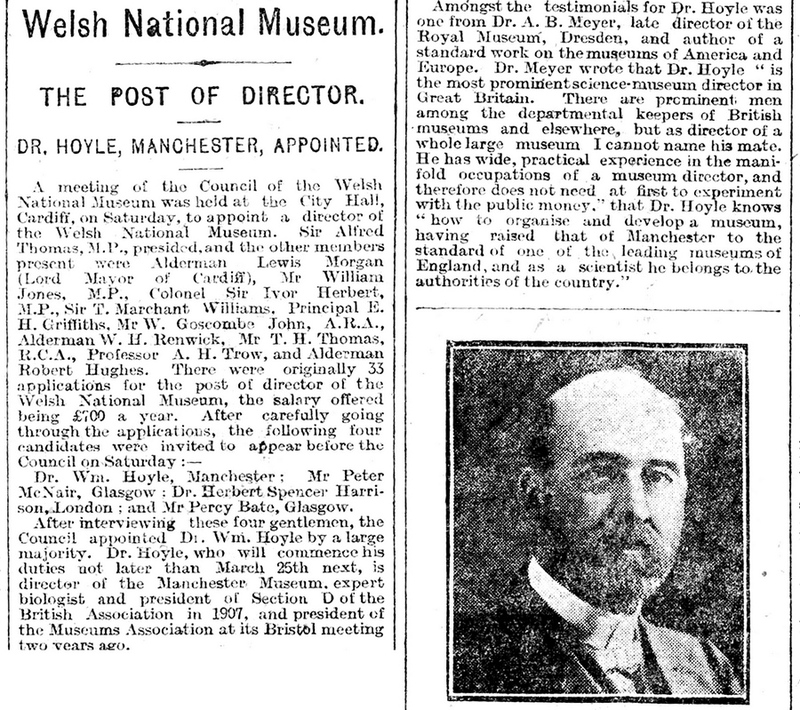 He was the son of William Jennings Hoyle, an Engineer, of Manchester, and was born on the 28th January, 1855. At his first school, in Old Trafford, he headed the Manchester list in the Oxford Local Senior Examination, obtaining a scholarship offered by Owens College, where he gained prizes in Engineering and Biology, including the Dalton Natural History Prize. Subsequently, in 1874, he obtained a junior studentship at Christ Church, Oxford, then worth £ 100 for five years, and took up residence at that College. At the conclusion of his Course he graduated with first class honours in Natural Science in 1877, and was awarded a scholarship at St. Bartholomew's Hospital, where he gained the diploma of the Royal College of Surgeons. He was then elected Demonstrator in Anatomy at Owens College, Manchester, and whilst holding that office was appointed, in 1882, to a position on the Editorial Staff, under Sir John Murray, of the Challenger" Expedition. He remained at this task for six years, and was then occupied in London, with the aid of a Royal Society grant, in working out the results of the Expedition. 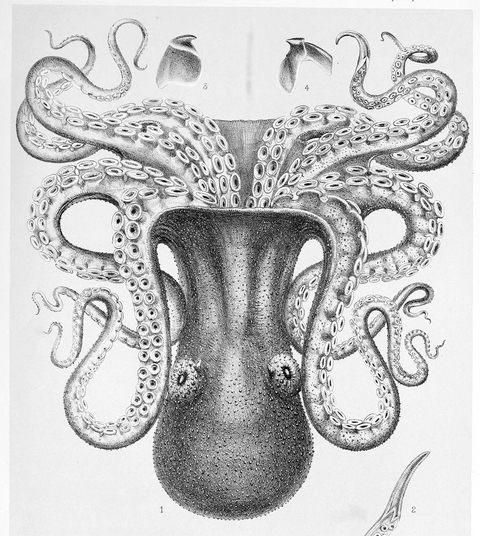 His chief publication in this connection was a volume on the Cephalopoda, consisting of 289 pages and thirty-four plates; and throughout his life he was recognised as the chief authority in this branch of science, his writings on the subject being numerous and important. 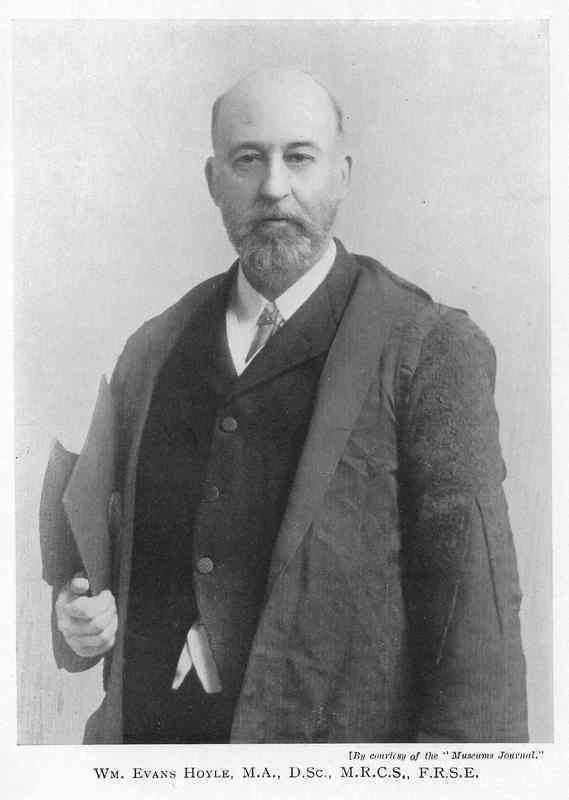 His inclinations towards Natural Science were so strong that he decided to leave the medical profession entirely and take up that branch of work when he was appointed Keeper of the Manchester Museum, in 1889, which post he retained for twenty years, and it may be said that here he found the work to which he was born. By his energy and enthusiasm, as well as his remarkable organising powers, he made this institution one of the leading museums of the world. 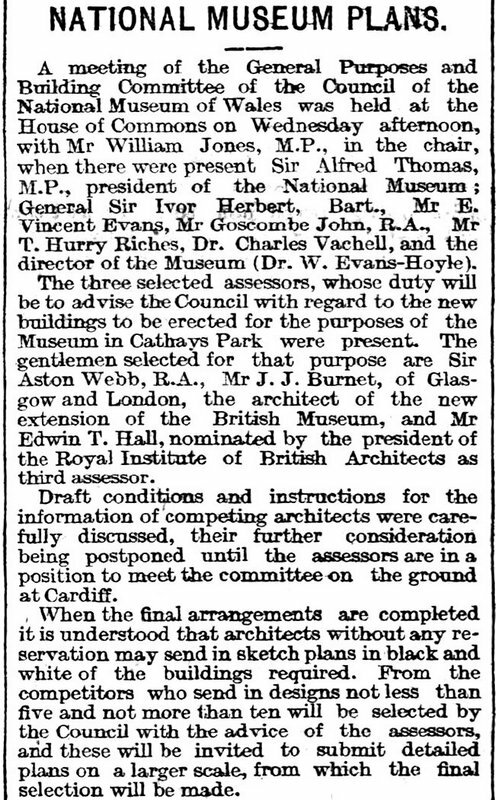 In 1909 the Governors of the National Museum of Wales appointed him Director of that institution, very wisely selecting their Director before the museum came into being. He threw himself into the work with characteristic thoroughness and enthusiasm, and it is not too much to say that he was jointly responsible, with the Architects, for much of the designing of that magnificent building. 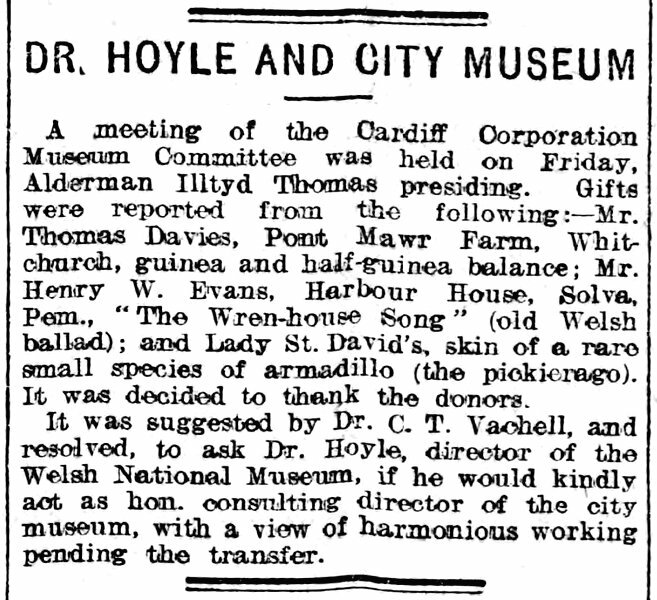 To Dr. Hoyle this appointment, which enabled him to start and follow up the development of a museum, represented the fulfilment of a cherished and lifelong ambition; and Wales was singularly fortunate in being able to obtain the services of so highly trained and competent a head during the most difficult and important period in the existence of its National Museum. It was a task for which he was peculiarly fitted by his wide knowledge and great powers of organisation but it was a great disappointment to him that difficulties made by the European War so delayed the progress of the building that he never saw the completion of his big undertaking, for in February, 1924, he retired from active life, owing to ill-health, though his services were retained by the museum in a consultative capacity. 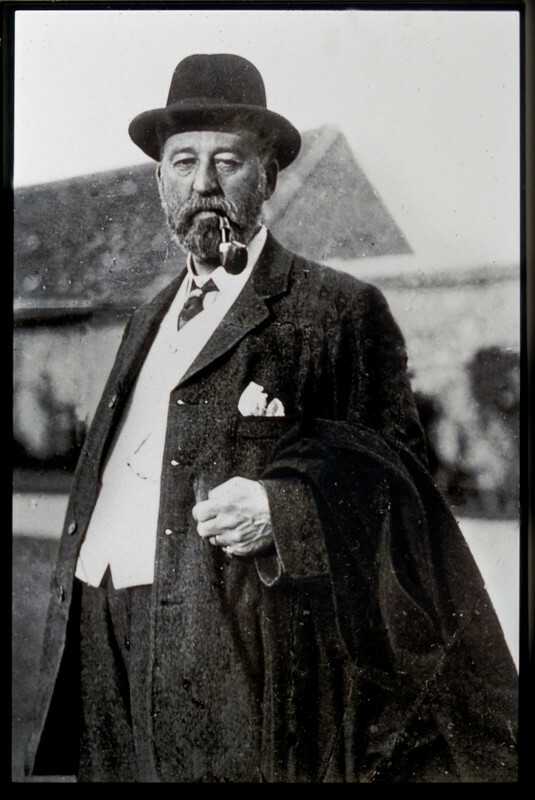 His connection with the Society began with his arrival in Cardiff, becoming a member in 1909 elected immediately to the Council, he occupied the Presidential Chair in 1916-17. On his retirement to Porthcawl the Society paid him the highest honour in their power by electing him an Honorary Life Member. 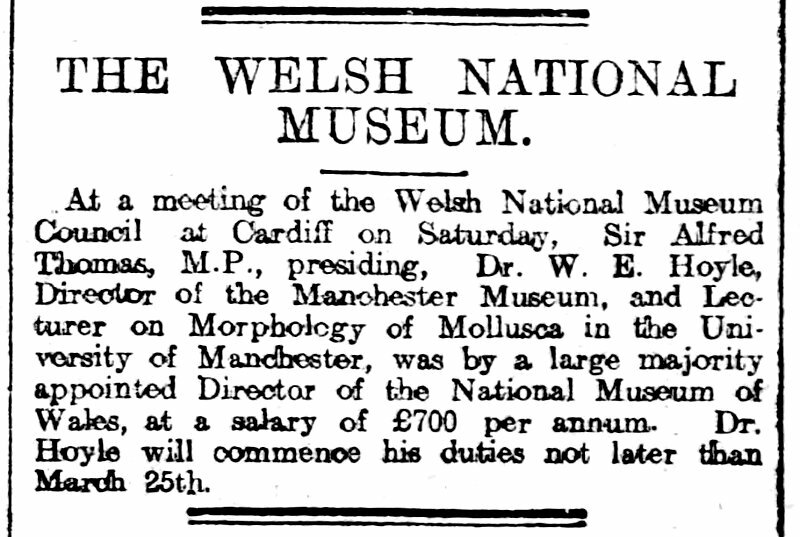 His sound Zoological knowledge and long experience of museum work made him greatly in request as a lecturer, both to the Society and to the Sections, particularly the Biological and Geological Section, of which he also acted as President; and his natural capacity in that sphere and his strong sense of humour gave his addresses a charm which always attracted an appreciative audience. He had, too, in a striking degree the power of interesting children in any subjection which he lectured to them. 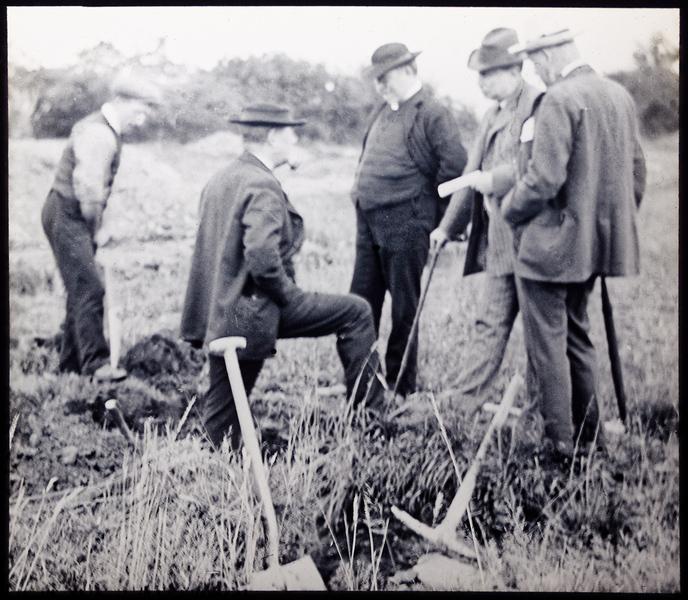 He had a ready sympathy with the work of others and was never too busy to help or encourage them in their studies, and those who endeavoured to help by additions to the Museum Collections were always made to feel that their efforts were appreciated. One of his chief hobbies was the care of cripples, and his influence in the medical world and untiring sympathy with the afflicted enabled them to obtain skilled help, and in many cases complete cures, where circumstances would otherwise have made it impossible. 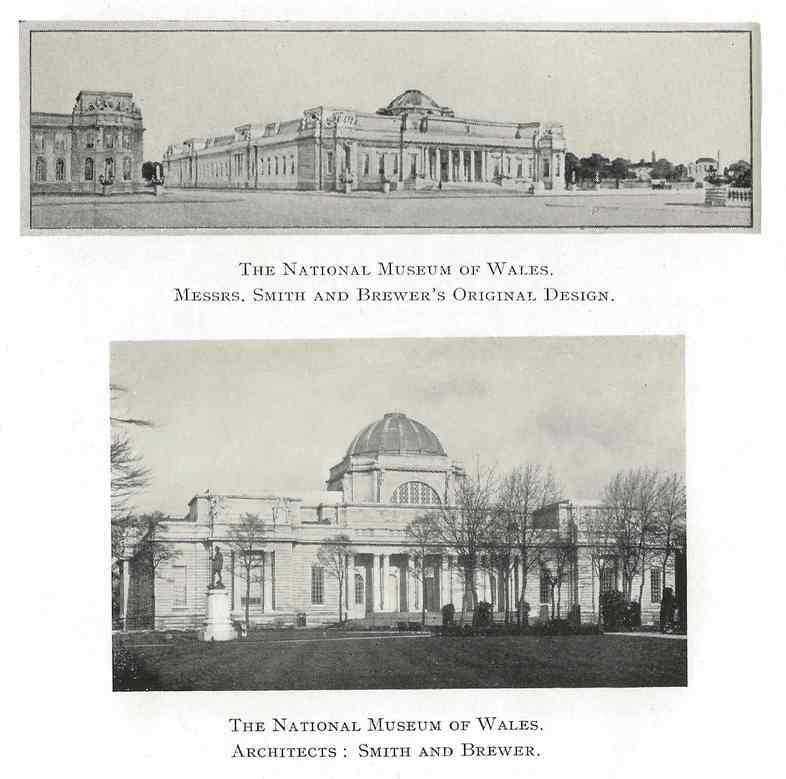 The Society, no less than the Museum, was extremely fortunate in his appointment to Cardiff, and his death removed one of the most valued benefactors of the Society. He was twice married, in 1883 to Edith Sharp, of Manchester, and in 1918 to Florence Ethel Mabel, daughter of the late T. Hurry Riches, J.P., of Cardiff, and widow of the late J. H. Hallett, J.P., of Radyr Chain. He was buried in Newton Churchyard, Porthcawl. 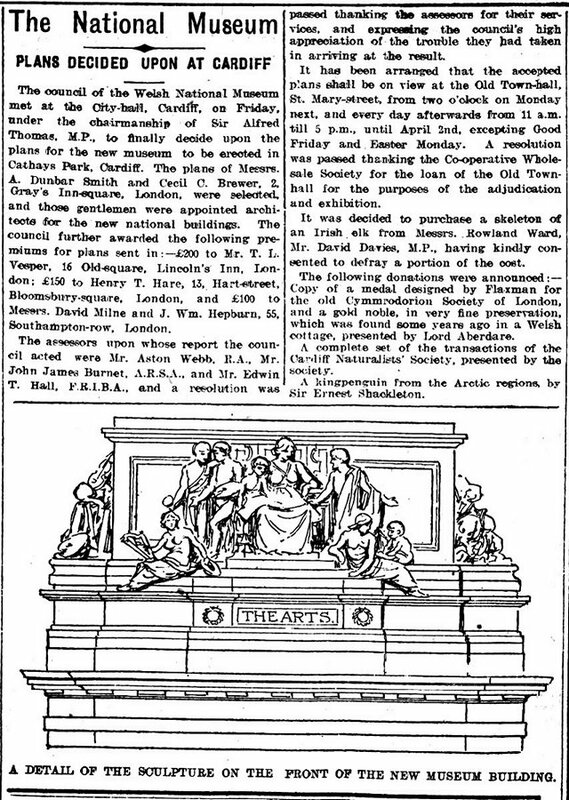 He clearly had a lot of involvement in the Society and with Society members including Charles Vachell 13th, 19th and 26th President working with as noted here him on the City museum development even before the National Museum physically existed. 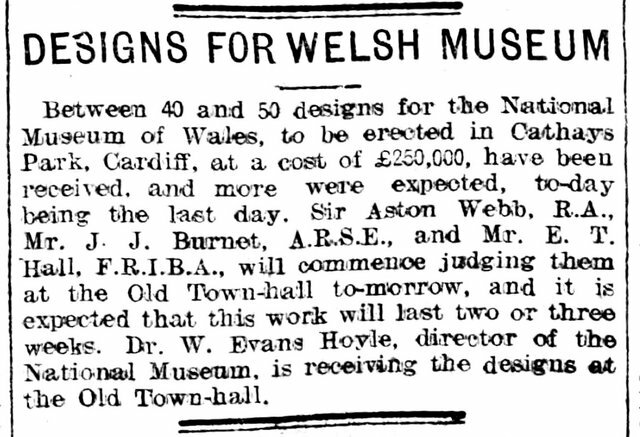 The plans for the Museum buildings were clearly a priority and it is as fast as May 1909 when a competition to design the new building was announced. It has already been noted in these pages that Edwin Seward 21st President had considered the commission to be his based on his prior work on a proposed municipal museum. This led to acrimony as noted on Edwin Sewards page. In the end something of the order of the number of designs shown below were received. An interesting sidebar regarding the design is given in the transactions. The outstanding alteration was the opening up of the dome. Lord Pontypridd was responsible for this, and but for his bringing forward the suggestion, the Museum might not have the existing impressive Entrance Hall, for it was designed originally to be completely covered over at first floor level. This amendment necessitated the provision of a second floor for the Court Room, the Library, and Administrative Offices, which, in turn, made it necessary to lift the dome considerably, which without doubt greatly improved the main elevation. The parasites of man, and the diseases which proceed from them. By Rudolf Leuckart, Professor Of Zoology And Comparative Anatomy In The University Of Leipzig. Translated From The German, With The Co-Operation Of The Author, By William E. Hoyle, M.A. (Oxon. ), M.R.C.S., F.R.S.E.